SLEEVE DESIGN Photos by Virginia Astley. Design by Martin Atkins and David A Jones. 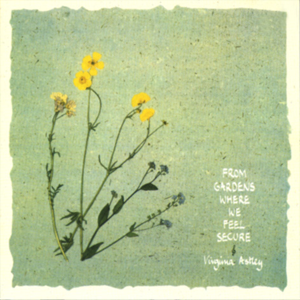 Following on from problems with She Sat Down And Cried, From Gardens Where We Feel Secure was Virginia Astley's debut album. The album's theme was a blend of live recordings of countryside sounds and music written by Virginia designed to evoke the atmosphere of a summers day. Each side of the album was titled 'Morning' and 'Afternoon'. The sound effects used on the album were recorded at various times between April and June 1982 at locations in and around Moulsford, Oxfordshire. 'A Summer Long Since Past' originally featured as the B-side to the 12" release of the single 'Love's A Lonely Place To Be' in January 1983. 'When The Fields Were On Fire' originally appeared on the compilation cassette Meridians Two released in May 1983. Happy Valley was Virginia's own label. The album was licenced to Rough Trade records for distribution. 'A Summer Long Since Past' was titled 'A Summer Long Since Passed' when it originally featured as the B-side to 'Love's A Lonely Place To Be'.